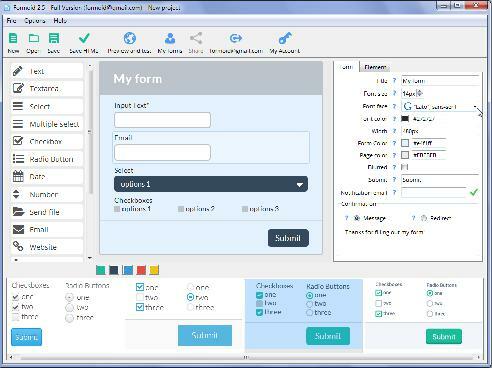 Formoid is a free desktop app that helps you easily create wordpress contact form, html email form, ajax form, jquery forms and more in a few seconds without writing a single line of code. Create amazing online forms in just a few clicks. The css file has a lot more than is needed. I just played with the Formoid app (Mac), and here are some of my initial impressions. •I like the whole idea. It's very easy to create the form. •I was a bit confused about the publish button. Perhaps if it was labeled "Publish HTML". •I saved the form I designed as a .formoid file. When I double-clicked the file, it didn't know to use the Formoid app to open it. •The css file has a lot more than is needed. Is it possible to only include what's in the actual css form layout. For instance, I didn't incorporate any file downloading in my test form, yet the css attributes were included in the style.css file. •Again, if I'm not using the download option, why include the script.js which is apparently just for downloads. Good luck on your app development, you're off to a good start! Unfortunately, it's impossible to include what's in the actual in your form. We've sent your request to our developer team. Hello. I try Formoid beta and at first look it is very interesting and useful. Naturally I begin with Russian language and immediately meet problems/ 1. Hello, I have been using and suggesting to other developers this great application. One thing I have come across and I have heard from others is the lack of a date picker/calendar field. Hej! Very nice work, I like it. But your form not support with word press blog! Hi, My share button is not blue like this one it is gray. What's wrong?